One of the best looks of the night, Nina Dobrev looked like red carpet perfection as she arrived for the 62nd Annual Emmy Awards on August 29. Nina rocked her champagne colored gown which came from the Fall 2010 collection of Zuhair Murad. Her sandals were customised Brian Atwoods and her sparkling jewels were on loan Chopard. Back when January Jones started attending awards like the Emmys, she tended to continue the Mad Men vintage theme off the set and on to the red carpet, now it seems she's doing hest best to leave those style behind going more fashion-forward than retro. Topping off the stand-out look was over $1 million worth of Cartier diamonds and some simple black pumps. Legs, teeth and a lot of skin were on show as Heidi Klum took to the Emmys red carpet on August 29. One of the only attendees to eschew the usual long gowns, Heidi showed off her pins in a teeny black Marchesa dress. Despite the body flaunting dress it was Heidi's accessories that really set this look apart: a huge statement necklace from Lorraine Schwartz, and stunning black spiked heels from Christian Louboutin. Lea Michele on the red carpet at the 62nd Annual Primetime Emmy Awards held at the Nokia Theatre in LA on August 29. Lea - who celebrated her birthday on the day - opted for a gorgeous deep, dark blue gown from her usual red carpet go-to: Oscar de la Renta. She told People: "I love Oscar de la Renta and I love blue. When I saw this, it was perfect!" Adding extra sparkle were some magnificent statement jewels from Lorraine Schwartz. Katrina Bowden was looking super pretty on the Emmy Awards red carpet on August 29. She wore a tiered BCBG gown and carried a blush-colored Swarovski satin clutch. Earrings fro Everlon added a subtle touch of glitz. Looking like a modern day Gone With The Wind heroine in her long tiered gown Glee's Dianna Agron graced the red carpet of the Emmy Awards on August 29. Dianna's floral organza came from designer Carolina Herrera and was paired with around $1.5 million worth of Cartier jewels, plus some unseen Louboutin heels. Sorry, no similar steal the style items for this look. Emily Blunt at the 62nd Annual Primetime Emmy Awards held in LA on August 29. Emily was an English rose in lavendar in her floral-embellished Dior gown. The gown was uber girly so adding just a little tough (but elegant) touch was a Lauren Merkin snakeskin clutch. She also wore a glitzy hair adornment from Lorraine Schwartz. Kelly Osbourne's gorgeous Emmy Awards appearance got a lot of people talking about how fab she looks - she says it's down to time of the treadmill but she's been looking better and better ever since appearing on Dancing With The Stars. Her gown was a Tony Ward Couture creation and was teamed with Martin Katz jewels. For similiar looking dramatic black drop earrings checkout Macy's $35.00 Monet Glass and Crystal Teardrop Earrings, or Forever21's $5.80 Black Razzle Dazzle Earrings. Eva Longoria went for classic glamour as she graced the 62nd Annual Primetime Emmy Awards red carpet with husband Tony Parker. Eva wore a sweeping strapless gown from designer Robert Rodriguez gown - although stunning the black could have been a little boring but Eva opted for some beautiful pink Loren earrings to amp up the wow factor. For a similar black gown look, Macy's currently has a beautiful black Speechless gown on-sale for $81.75. Claire Danes was stunning in decollete to floor sparkles at the Emmys in her Swarovski crystal-covered Armani Privé gown. Anyone looking for a similar show-stopping sparkle style, there is the silver embellished evening gown from edressme.com; it costs $550.00, sounds expensive but usually with super glitz comes a super-high price tag. Kim Kardashian on the 62nd Annual Primetime Emmy Awards held on August 29, 2010 in Los Angeles. Kim went for the Grecian look with her wavy updo and flowing white Marchesa gown. Glad to see her looking fresh in white after all the black she's been wearing lately but the style from many angles made her look bigger than she actually is. Lorraine Schwartz jewels completed the look almost winning look. For a similar Grecian style there is the T-Bags beaded maxi dress; it's not totally like Kim's but does have the beaded collar, total Grecian vibe and without a Marchesa price-tag. Newlyweds Anna Paquin and Stephen Moyer cosied up on the Emmys red carpet and Anna looked all dramatic in her black Alexander McQueen gown with bold gold embellishments. The high front showed off her shining patent YSL platforms, and House of Lavande jewels plus her Cathy Waterman wedding ring added extra glitz. Get the patent platform look with Steve Madden's $89.95 "Caryssa" Pumps, or Next's £30 Patent Platform Courts. A look at just a few of the guys from the Emmys red carpet last night (August 29th). Cory Monteith looked very suave in a Giorgio Armani tuxedo with a white shirt and black silk tie. 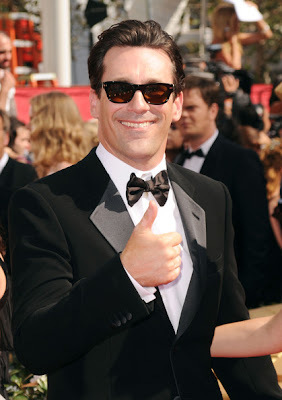 Just as dapper as Don Draper, Jon Hamm also wore a Giorgio Armani tux along with shoes from Tod's. Chris Colfer was in Armani too: Emporio Armani, wearing a classic white shirt, black tie and tux combo. A muscial note shaped pin on his lapel added a great little touch. Hills stars Stephanie Pratt and Lauren Bosworth at the 2010 Emmy Awards held in LA last night (August 29th). Stephanie was looking nice but not really Emmys appopriate in her mini dress - its more an MTV Awards look. She teamed the mini with black Stuart Weitzman platforms. And while Stephanie was perhaps too low-key, Lauren tried to go for serious elegance in a look she said was inspired by the fashions of Mad Men. She looked conservative in her green Karen Caldwell shift dress, updo and sleek Christian Louboutin peep-toes. Some fun touches topped off Lo's look though: pink lips, big beehive, and a gorgeous floral ring. A quick round up of the Glee star looks from the 62nd Annual Primetime Emmy Awards held in LA on August 29 (more coverage later with close-up looks for accessories and steal the style links). She's used to winning with the Cheerios and now Sue Sylvester (aka Jane Lynch) won the award for Best Supporting Actress in a Comedy Series. Jane wore a deep purple one-shouldered gown from designer Ali Rahimi. Jenna Ushkowitz was bold in her red dress from Kevan Hall, paired with Neil Lane jewels, a glitzy clutch and some funky metallic sandals. Heather Morris was gorgeous in her uber-glam golden sequined dress from Ina Soltani, and old-Hollywood style red lips. Jayma Mays was quite simple in her blue strapless Burberry which she wore with (unseen) Jimmy Choo "Zena" platforms and gold jewelry. 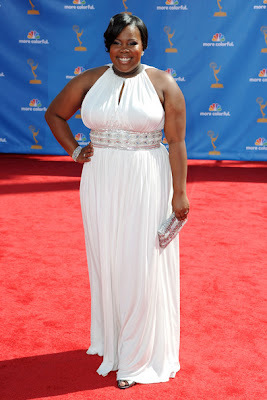 Amber Riley was beautiful in her white Grecian-style dress which was custom-made by Melissa Masse, and teamed with glittering Chopard jewels and Swarovski clutch. The gown wasn't a hit with everyone but Dianna Agron looked pretty (as she always does) in her Carolina Herrera gown. And Lea Michele got a big thumbs up from most fashion critics in her petrol-blue Oscar de la Renta gown. First post of the Emmy Awards coverage goes to Maria Menounos who was stunning a Ralph & Russo gown which was custom made for her. She wore the gown with her hair up to show it off to full effect and teamed with Jimmy Choo's metallic "Kenzie" heels (they went unseen but Maria really didn't need them with everything else she had going on). Jessica Lowndes raunched it up in revealing red as she attended the 2010 Entertainment Weekly and Women In Film Pre-Emmy party in LA on August 27. Jessica wore a dress which was daringly low-cut dress on top but with a playful, flirty skirt at the bottom. Adding a little vampy-ness she sported red lips and nails, and carried a matching red clutch. Jessica's heels are from Jimmy Choo and cost £525.00 at the jimmychoo.com site; they also come in Black. Along with Jessica Lowndes, Anna Paquin was also at the 2010 Women In Film Pre-Emmy party on August 27. Like Jessica, she too opted for red, but Anna was quite a bit more modest in her chic one-shouldered dress from Preen which she wore with black patent Brian Atwood heels. Get Anna's look, pairing the $84 MM Couture One-Shoulder dress with the $49.95 Black Patent Pumps from Madden Girl. Taylor Momsen pictured with some of the other members of The Pretty Reckless as they arrived at the Late Show with David Letterman studio on August 25. Taylor was dressed in one of her typical stage outfits, teaming her lingerie-like dress, and stockings with the almost 8-inch-high pistol-heel platforms she's been wearing while on tour. For anyone interested in these platforms (and I issue a health warning because, seriously, how does she walk around in those without twisting or breaking something) they are Pleaser's "Bondgirl" platforms and are on-line at endless.com.